Only a few years into her burgeoning career, Amy Grant released two live albums showcasing her unique collection of genre-defying singer-songwriter tunes, folk meets gospel. 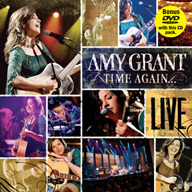 Twenty-five years later, Amy Grant comes full circle releasing her third live project, Time Again: Amy Grant Live, weaving a retrospective journey through a lifetime's worth of her most treasured songs. Amy Grant is a recipient of prestigious Star on the Hollywood Walk of Fame. Time Again showcases Amy Grant's biggest hits and her memories from more than 25 years of creating music, follow up to 2005's GRAMMY WINNING album 'Rock Of Ages','Hymns & Faith'. BONUS DVD features a brand new studio recording of the Amy classic 'In A Little While' and also includes a full lyric book.